JAPONESQUE® Shimmer Lashes have a unique criss-cross design. These attention-grabbing lashes provide subtle length and moderate fullness. 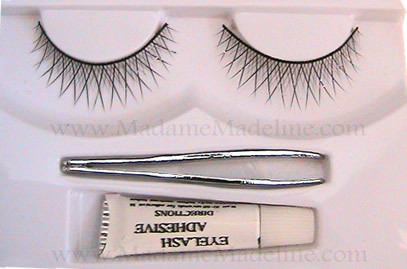 Store lashes in anti-bacterial base included with the Japonesque Lash Placement Tool.l. My own are very sparse and short, always have been. I have worn Ardell Fashion lashes 109 for 19 years, and I wear them to bed! I wash them and curl them in foil wrapped around a small pencil to dry. These Shimmer lashes are my new toys. I now alternate these with my ardell 109 lashes. a must buy..even though its pricier than some other brands..these lashes look so natural on you. no one will know you have fake eyelashes on.they look so natural on me...the shine or glitter on the lashes are so tiny that you cant see them so its suitable to wear for the day look.its beautiful and natural.love it. the shimmer on this model is very little, so I can wear them for day.